Which film speed is that Super-8 cartridge notched for? Is that Tungsten or Daylight stock? Which ASA values can my camera read correctly and does it move the Wratten filter out automatically when daylight stock is used? Since more than 30 kinds of Super-8 film are available today, most made in small batches, these questions are more pressing than ever before. The "Notch Ruler" that has been around for a while has some flaws, simplifies too much and thus leads easily to incorrect results. This is why I made two new, simple tools to clarify a confusing topic once and for all. Find out all about your favorite film stock now and understand how your camera is interpreting its notch codes. What’s wrong with the old Notch Ruler? The numbers are above the lines, not on the lines. This can easily be misleading. See below graphic – the 0.7" notch distance (3) of a Kodachrome 40 (1) result to 40 ASA, and both numbers are in separate lines (4)! The Notch Ruler does not make clear that it is intended for cameras, not cartridges. Using it on a cartridge leads to above problems. Even when used in a camera, the Notch Ruler suggests that the camera can read the film type correctly, all based on availability of a sensor switch. This is unfortunately not true, see below why. As much as I appreciate the effort of making and publishing it, I think it leads to more confusion and damage than it helps. Even if one uses it correctly, it doesn't mean that the interpreted results are right. There was never a bigger variety of film stock available than there is in today’s market. This might make you wonder since small gauge film definitely is no longer a mass market – but since the famous Kodachrome 40 (K40) and its unique process K-14 have been discontinued, it suddenly makes sense for folks like Wittner, Spectra Film or Pro8mm to package recent film stock into that complicated cartridge and sell a certain volume. I am aware of 30+ different materials from 10 to 500 ASA, sensitized for Tungsten or Daylight, negative or reversal, color or black&white. But: How does your camera handle such obscure material? To understand why this is, history tells the story: When Super-8 got to market in 1965, almost all available film was tungsten stock with 40 ASA, which effectively reduced to 25 ASA when the built-in Wratten filter reduced the light by ⅔ stops. This was true for Kodachrome as well as Agfachrome, Moviechrome and their various OEM cohorts from Port, Boots, 3M, Ilford, Perutz and others. Years later Ektachrome 160T hit the market, requiring some 500W lamps less to actually shoot on Xmas Eve and still had 100 ASA Exposure Index when filming with filter in daylight. Fortunately, ISO-3067 and SMPTE-166 specified that the cartridge only needed a wider ASA notch to set the camera's internal light meter to the correct film speed. For decades, these were practically the only films on the market. Since continuous sensing of the width of a notch located that close to the frame window is mechanically rather difficult, many camera manufacturers made their life easy: They only distinguished with one or two little switches between 40 and 160 ASA cartridges. Good enough in those days. (Kodak's Instamatic and other cheapo cams even blindly expected 40 ASA all the time!) It is not smart to ignore a specification for cost reasons. It is however even worse to dilute a spec, especially if you are its inventor. In 1974, Kodak brought the Ektachrome 160 Type G to market. Its color layers were reversed (green on top) -- due to this trick and a fairly low overall color saturation, the film no longer needed the Wratten filter. It worked equally good/bad with tungsten illumination as well as in daylight. Even though it had relatively fine grain and was quite sharp, it was always a compromise. The cartridge was notched as daylight film. Many cameras thus rotated the Wratten filter out and changed the (simply guessed) 160 ASA not to 100 ASA as the spec would have suggested it. Other cameras (like late Bauer models) did not have a sensor for the Tungsten notch at all and simply coupled the sensitivity to the camera's filter switch: 40 ASA without filter, 25 ASA with Filter (and equally 160 ASA / 100 ASA if the notch was somewhat bigger). It gets even more confusing: Some manufacturers labeled the camera inside with copy like "works with 25 and 100 ASA daylight film" -- actually meant was “Tungsten stock with filter rotated in”. Even some expensive Leicinas did not read the Tungsten notch, but allowed manual setting to daylight stock through a 3rd position on the filter switch. It is also confusing that identical notch widths have differing meanings depending on the cartridge's color sensitization notch. It's a fact that it is like that. Why Kodak came up with this idea can only be guessed: The internal Wratten filter is located right in front of the film, not in front of the lens like other filters usually are. The viewfinder and the internal light meter usually do not "see" this little yellow-orange gel filter. To compensate the ⅔ stops of light loss this filter actually causes, the camera simply "told" the light meter a different, ⅔ stop-lower film speed (e.g. for Kodachrome 40T this was then 25 ASA). In reality, the film stock's speed does not change at all, it is just less light that makes it through the filter. I guess Kodak confused themselves through this "40T needs to be exposed like 25 ASA in daylight, so lets call the daylight speed 25 ASA" trick. Most likely, in some important meeting, it caused a sentence like "If K40 has 25 ASA in daylight, actual 25 ASA daylight stock should have the same notch size!" Totally confused? Don't worry, you made it through the hard part, and there is light at the end of the tunnel even if you could not follow the above. Below find two simple, yet powerful tools. Just print and cut them out in 100% size, without any scaling. 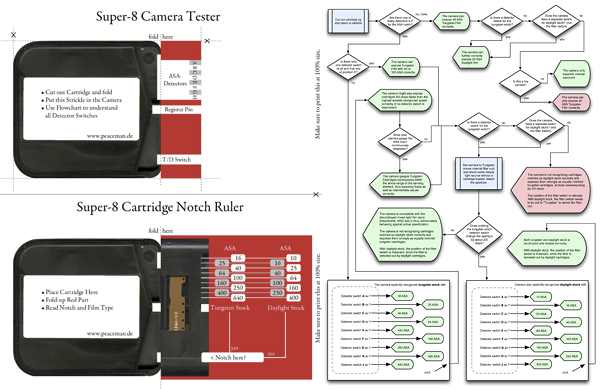 Put them, together with a copy of the flowchart in your camera bag and you will always be sure what kind of film stock and camera you have and how your camera recognizes that particular film stock. What do these tools teach us? The new Ektachrome 100D gets recognized correctly in many more cameras than was its unlucky predecessor 64T. That's a good thing. The position of the filter switch is irrelevant in most cameras, since the absent Tungsten notch causes the filter to be rotated out anyway. Wittner's excellent WittnerChrome 100D, containing the same film stock, is notched to 64D. This causes a modest overexposure in higher end cameras that read correctly, however, this is good for skin tones and generally not a bad idea with this stock. Even Kodak treats the notching differently with recent cartridges sold. mentions that the Vision 200T is notched as 160 ASA. Measuring a Vision 500T shows it is notched as 400 ASA Daylight (!) stock. On the other hand, Ektachrome VNF 7240 as well as Plus-X 7267 are notched to actual intermediate values (125 resp. 32 ASA). It seems that Kodak uses the next spec'd notch for its negative stock, for reversal material they are more precise and allow values in between. So what to do if your camera does not recognize your film stock correctly? There is no single universal solution, but some hints may help. It does help to understand your camera, think through the above and try out. It is easy to alter exposure if your camera provides a manual exposure control dial. A contre-jour key or mode can help too, it causes about one stop more light on your film. Neutral density filters can only help if your camera does not meter light through the lens but externally. Sometimes, it can also help to widen the notch with fine pliers or to make it smaller with a patch of ribbon epoxy glue. A manual exposure mode or exposure lock can help must but be re-set for every scene. If your camera has a variable rotary disc shutter, closing that might help too to reduce the light getting to the film without the exposure meter correcting that by opening the aperture. Brave hobbyists "simply" remove the internal Wratten filter, but this locks you in to daylight stock only and does not help in all cases. One thing is crucial to keep in mind while studying so much theory: Our cameras are all 30-40 years old and have rarely been serviced on a regular basis. The built-in light meters are often adjusted more or less wrong or lost their linearity. So even if your favorite camera exposed K40 perfectly, it might fail with 100D even when recognized correctly. You can verify your camera's light meter with comparing its results against a modern SLR or DSLR. Just set that to the same film speed as your film stock (so ISO 100 for E100D), the shutter time to 1/40 (or whatever your camera has, it's more 1/30 for XL cameras at 18fps) and compare the suggested aperture values for various motives in various light conditions. The best way by far though is to sacrifice one cartridge to test your camera(s). Shoot a gray wedge in both bright and dark light, with various focal lengths and watch the results carefully during projection and with a magnifying glass. It’s worth it. Even turning the camera in for service is cheaper (and less frustrating) than dozens of cartridges which have been incorrectly exposed. Eingetragen am 17 Oktober, 2010 um 23:41:58 in Kategorie Basteln, Super 8.